June 2017 has been a month of real contrasts. A thundery deluge on the 2nd was followed by conditions typically brought by the European monsoon. Warm weather followed in the second week before a full-blown heatwave arrived bringing the hottest June spell since 1976. The mean temperature for the month finished at 18.9C, that’s 2.8C above average. It was the second warmest June in a local record going back to 1797. Though it was only 0.4C cooler than 1976 it was also much wetter than that very dry month. Though it appeared a wet month, over two-thirds of the recorded rain fell in two episodes. Sunshine for the month was 202.3hrs, 114% of average. In terms of the rest of the summer you would be forgiven for thinking that we have already had more than our fair share of good weather. One way of looking at it is to count the number of days the mercury rises above 25C with 10 hrs of sunshine. Since May that has happened on 13 occasions – far higher than anything in the past four years. It will be interesting to see if July and August, normally the months where we get most of our summery weather are as good as June. 1st: Sunny with scattered cumulus through the morning, the cloud thicker during the day. 2nd: Cloudy start though brightening up with long sunny spells. Cloud bubbled up and a heavy thunderstorm moved in at 3.15pm and lasted an hour. Sunny again by 6pm. 3rd: Bright start with decreasing cloud. 4th: Sunny start though cloud bubbling up late morning into early afternoon. Cloudy and breezy with a few spots of rain at dusk. 5th: Cloudy and very breezy start. Bright at times. 6th: Rain and very windy to start with gale force 9 in Channel. Rain lasted into the early afternoon before clearing to bright spells. Odd shower overnight but remained blustery with a few trees down. Flowering cherry fell at mum’s at 6.30pm. 7th: Sunny with long sunny spells. An area of rain after dark then overcast through the night. 8th: Cloudy and breezy, a shower at noon and some bright spells at 1pm. 9th: Sunny though breezy with lots of cloud. Spots of rain in the wind. 10th: Sunny and warm start with lots of sunshine. Very breezy. 11h: Sunny and feeling very humid but breezy. Alternating between very warm sunshine and cloud. Very brief few drops of rain at dusk then mostly cloudy night. 12th: Sunny periods throughout the day. Cloudier at times. Clear overnight with warm, sunny start. 13th: Sunny, clear start and feeling warm early. 14th: Sunny most of the day with odd cumulus. Very warm though turning a bit fresher overnight. 15th: Sunny morning though with more cloud than yesterday. A fresh breeze developing. 16th: Sunny with variable cloud. Warm. 17th: Sunny though lots of hazy cumulus. 18th: Sunny though much cloud amid the humidity. Felt airless with only limited breeze. Oppressive overnight. 20th: Bright start though cloud breaking at 11am to leave clear afternoon with just a couple of cumulus. 21st: Sunny and hot all day with patchy cirrus. Warmest June day since 1976 at Heathrow 33.9C. Warm overnight but more of a breeze. Sunny early. 22nd: Very brief rain shower at obs time then sunny intervals. Cooler but still humid. Very breezy overnight. 23rd: Long sunny spells with hazy cumulus. Although cooler still hot in the sunshine. Cooler overnight and breezy. 24th: Mostly cloudy though bright. A sharp shower in the evening. 25th: Bright though mostly cloudy. A couple of bursts of drizzle but then sunny spells late evening. 26th: Sunny with lots of cirrus, cirrocumlus and a fallstreak hole in the sky. Warm but low humidity. 27th Sunny start though sun becoming scarce. Patchy light rain at 10.30am and thunder then a heavy shower at 3.45pm. Rain in the evening that lasted into the early hours. 28th: Cloudy and very dull at times with very light drizzle. Humid. 29th: Cloudy though bright with some sunny intervals. 30th Sunny though with lots of cloud. Decreasing cloud in the afternoon and a pleasant evening. This year finished as the 14th warmest on record – some 0.5C warmer than the 1981-2010 average – though 0.2C cooler than 2015. Six months of 2016 were roughly average – the means being within +/-0.7 every month, bringing the mean temperature to 11.7C. Rainfall was less remarkable with the year being a little drier than average. The total of 561mm (93% of 1981-2010 average) puts it as the 122nd wettest since 1797, just 8mm wetter than 2015. It was also a slightly duller than average year with 1,390 hours of sunshine recorded. That’s 93 per cent of average, the 92nd sunniest since 1881 – the least amount of sunshine for 12 years. October 2016 was yet another dry month, a pattern that has emerged since the middle of June. Just 52 per cent of the October average was recorded. The monthly mean finished 11.5C, 0.3C above average and ending a three-month run of warm temperatures. So what has November got in store weatherwise? The models on the 1st suggest an anticyclone anchored to our west over the Atlantic will bring a regime of, at times, chilly northerly winds and the potential for rainfall, much probably in the form of showers, driven by low pressure in the North Sea. Where skies clear at night there will be potential for the first air frosts of the autumn. Beyond the grasp of the models my long range outlook method suggests an average or cold month is most likely: average and cold are both 30 per cent probability. Rather cold and severe are both 20%! There appears no chance of anything mild. Rainfall appears that it will be skewed toward something above average at 40 per cent, though average and below average are both 30 per cent. Sunshine looks average at 57 per cent probability. So, to sum up, we’re looking at a mean of 6.8C, rainfall: 55mm, sunshine: 41hrs. 1st: Rainy start with showery bursts to 11.25am then through afternoon mostly cloudy. 2nd: Sunny but chilly, feeling very autumnal. Clearing into the evening with a cold night to follow. 3rd: Sunny, gin clear all day until 2.08pm. 4th: Another sunny albeit slightly hazy start then patchy cumulus. Warm in the sunshine even with a easterly breeze. 5th: Sunny start though breezy and with quite a few cumulus around. Cloud streets observed at 10.30am, the cloud tending to decrease and completely melt away by 4pm. 6th: Sunny start but with much cloudier spells at times. Warm in the shelter. 7th: Cloudy all day, the cloud thick enough at lunch time for drizzle that damped the ground. 8th: Cloudy with bursts of light drizzle in the morning, some brightness. A heavy shower at 2pm was brief then cloudy. Clear and cold overnight. 9th: Sunny until 2pm with patchy cumulus – a really glorious morning. Sunny spells in afternoon with cold night to follow. 10th: Sunny with just patchy cirrus first thing. Thick patches of alto-cumulus drifted across from time to time. Cold overnight. 11th: Sunny with patchy cumulus which melted away through the day. Showers after dark, one at 2330z. 12th: Cloudy and damp start. Short, sharp shower at noon then mostly cloudy. 13th: Rainy , wet start thanks to a streamer of moderate to heavy showers. 14th: Cloudy am but with lots of sunshine mid-morning before clouding over again though staying bright. 15th: Bright start but with lots of cloud pushing in and light burst of drizzle at noon. Cloud thickened before rain moved in after 5pm and fell intermittently through the night. 16th: Damp start as the remnants of the overnight rain cleared away, then becoming brighter at 11.15am. Sunny spells for a time before turning cloudier with some very sharp showers on yet another convergence line. 17th: Cloudy start but soon brightening up with some pleasant sunny spells. Heavy burst of rainfall at 5.30pm with more showers at midnight and early hours. 18th: Cloudy though quickly turning bright and breezy with long sunny spells after clearance of the cold front. 19th: Bright start though more cloud around than sun all day. Feeling colder than of late. 20th: Bright and breezy with variable cloud and sunny spells. A short shower at 2pm damped the ground. Clear spells overnight made it chilly. A shower at 9.30am. 21st: Cloudy and chily start. 22nd: Cloudy and cold start, brief clearance at 11am then sunny spells. 23rd: Sunny and clear to start though cold. Sunny spells into the afternoon. Cloudy overnight. 24th: Cloudy and cool during the day and overnight. 25th: Dull and cloudy with only limited brightness. Clear early evening with temp falling before it turned misty. Cloud pushed in raising the temperature. 26th: Cloudy start and turning very dull before bright spells spread in at noon. 27th: Cloudy though getting brighter through the morning with a brief clearance at noon, then bright and sunny intervals. 28th: Sunny and very mild to start. Sunny spells through the day. 29th: Cloudy start with bright intervals after midday. Clear spells after dark with fog forming after 11pm which gave a foggy start. 30th: Foggy start then cloudy and miserable. 31st: Fog to start then clearing at 11am. Gorgeous sunny day thereafter. Last month was the second warmest September in a local record going back to 1797! The monthly mean finished 17.8C, 2.4C above average. Despite being an ‘autumn’ month September was actually a full degree warmer than June! September 2016 was the second warmest in a local record back to 1797, though we’re talking by fewer than tenths of a degree. The hottest September day since 1959 was recorded on the 13th when 33.1C was reached, the sixth equal hottest in the local daily record back to 1848. 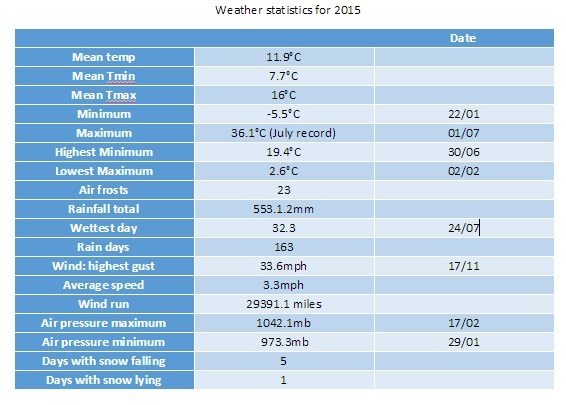 The month also saw the warmest minimum recorded since 1959 when the mercury failed to fall below 18.7C on the 6th. It was another very dry month, the third much drier than average month in a row: just 27.7mm fell, 24 per cent of average, making it the driest September since since 2007 and the 12th driest in the local record. Like August, the month only falls down in terms of impressiveness when sunshine hours are considered. Some 119 hours were recorded, that’s 85 per cent of average, making it the dullest September for 15 years. So what has September got in store weatherwise? The models on the 1st suggest that a large Scandinavian high will become established to our NE bringing lots of settled weather and showers on coasts. There’s obviously the chance of trough disruption as the month progresses if the anticyclone’s influence declines. Beyond the grasp of the models my usual long range outlook method falls down this month due to September’s warmth and dryness – there is nothing within +/- 10% of September’s statistics. I would guess, however, that we are looking at another drier than average month with frost becoming a risk as the month progresses where skies clear. There is also the chance of more pleasant autumn days where skies are clear during the day. My September outlook for temperature was poor. I predicted a mean of 15.3C (outcome: 17.8C). It was much, much drier than I thought: 300mm (outcome: 27.7mm). Sunshine was poor: 140 hours (outcome: 119 hours). 1st: Sunny start but cloud gradually increased until it was overcast by 6pm. Clear spells overnight but warmer than previous nights. 2nd: Cloudy though some brighter intervals. 3rd: Sunny start, cloud began to pile in at 12.30pm with rain arriving at 5.30pm, this fell through the evening with some showers in the early hours. 4th: Bright, breezy start but rapidly turning cloudy and dull. Some rain overnight. 5th: Light rain and dull to start – this quickly clearing to cloud by 3pm. Things remained cloudy with a muggy night. 6th: Cloudy, dull and muggy start after warmest September night on record. Another warm night though muggy. 7th: Cloudy to 11am though sun breaking through as drier air arrived. Feeling humid. 8th: Sunny start but with plenty of cumulus, this quickly decreasing to leave clear sky. 9th: Cloudy morning though sky seemed to periodically clear of low cumulus before becoming overcast and very breezy in the afternoon. Some rain overnight and just before obs time. 10th: Cloudy start with patchy light rain, this briefly turning heavy at 1pm before turning occasionally moderate. Dreadful afternoon after recently. Clearing overnight to leave a sunny start. 11th: A glorious sunny day with only the odd patch of cirrus. 12th: Bright start with some sunshine, clouding over with a few splodges of rain with warm front. Then sunny and very warm. 13th: Sunny start with a few cirrus and castalanus around. Breezy at times with the thermals. The warmest September day since 1959 and 6th equal warmest since 1848. 14th: Sunny start with a few cirrus. A few patches of alto-cumulus later. Very warm but not as hot as yesterday. Warm, pleasant evening. 15th: Sunny with a few wispy cumulus, clearing to hot sunshine. Some alto-cumulus developed at 2pm and towering cumulus could be seen in distance. Thunderstorms reporting to NW of London. Cloudy and warm overnight with eight peals of thunder in the early hours and heavy rain. 16th: Light to moderate rain through the morning, petering out at 1.30pm. 17th: Cloudy, cool and breezy all day, at times dull. 18th: Cloudy all day, a bit warmer than the previous two days. 19th: Cloudy start though with sun breaking through briefly at 11am until 1pm then cloudy again. Rain at 1am that didn’t last long enough to register. 20th: Cloudy and fairly calm – a nothing day with odd very light drizzle. 21st: Bright start with cloud breaking to long spells of sunshine before more cloud moved in. Warmer than of late. 22nd: Cloudy but sun broke through giving pleasant afternoon and cool overnight. 23rd: Sunny, gin clear and cold start. Just a few fair weather cumulus through the day. 24th: Sunny start with cloud decreasing. Very warm in sun but cloud and breeze built through the day. Overnight light rain between 6am and 9am. 25th: Bright start after overnight light rain. 26th: Bright start with a few cloud breaks here and there. Heavy shower at 12.15pm with further threat of rain but stayed dry. 27th: Bright start with signs of a cold front moving in from south then cloudy. 28th: Sunny start with patchy cirrus, this tending to thicken at lunchtime to turn mostly overcast with humidity increasing. Breeze also picked up with reappearance of sun mid afternoon. Cloudy, very mild and breezy rest of the day. 29th: Cold front and brief heavy rain swept in at 10.03am. Then intermittent falls until 11.23am. 30th: Sunny, gin-clear start, patchy cumulus bubbling up at 10.30am. Cloud grew thicker around 12 noon with brief shower at 1pm. Then sunny spells and cloudier periods. Another shower just after nightfall then clear. Cloud moved in after 2am with another shower. Early sunshine gave way to moderate showers around 9.45am. The coldest night in three years was recorded last month together with the first lying snow in January since 2013 – though you had to be up early on Sunday 17th to see it. For anyone looking for ‘traditional’ winter weather it was pretty desperate stuff and seems a continuation of the mild winters of the past three years. Apart from a mild final week much of the month was rather cold with a couple of sharp night frosts that affected many early daffodils that bloomed during the super mild December. 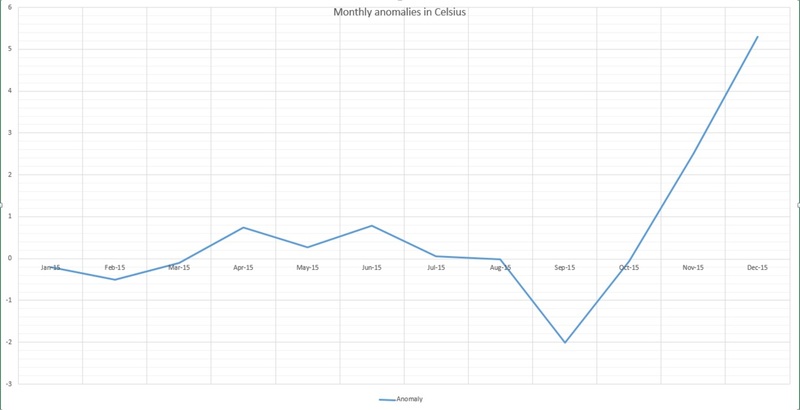 Rainfall of 65.8mm was 124% of average – very similar to last January’s total. Mean temperature for the month was 5.8C, 0.6C above the 1981-2010 mean. It felt far cooler, however, because the December mean was 5C above average. Sunshine was just above average. Over 54 hours were recorded, 108% of what we can expect to see during an average January. The wettest day occurred on the 10th with 11.6mm. So what has February got in store weatherwise? There is no sign of any longer term changes in the pattern of synoptics across the UK. All models continue to suggest a very volatile jet stream with resultant low pressure close to or across the UK for much of the first half of February. This week westerly winds will remain strong with severe gales in the north in association with Storm Henry over the next 36 hours. The current mild and damp conditions in the south should be replaced with colder, showery air moving south later on Monday, lasting into Wednesday. On Thursday another large warm sector will move up across the UK from the SW returning mild and damp conditions. At the weekend all models show low pressure areas taking a much more southerly route across the UK with gales and wet weather. While no cold weather looks likely there may be incidences of very heavy and thundery showers. Only GFS on Monday is showing any hint of more settled, colder weather at the end of the period. Using my long range method February is looking average, very dry and dull. A mean of about 5.9C, just over average, is the highest probability at 71%. Something ‘rather mild’ comes in at 29% probability. Rainfall is looking low: 15mm represents something 38% of average. Sunshine totals will be low and it could be a dull month, around 60 hours of sunshine, that’s just 82% of average. My January outlook for temperature good. I predicted a mean of 5.2C (outcome: 5.8C) with 59mm of rain (outcome: 65.8mm). 1st: Bright after sunny, clear dawn before clouding over with light rain. Rain at midnight. 2nd: Cloudy start after early overnight rain. Rainy spells and blustery throughout the day. 3rd: Drizzle to start then damp before more rain moved in at 11.30am – this fell intermittently through the day and evening and was often heavy. 4th: Bright, damp start after overnight rain. Some light outbreaks up to 2pm. 5th: Sunny, clear and cold start with contrails dotting the sky. Clouding over later with rain after 6pm. Misty around midnight. 6th: Bright, very damp start. Mostly cloudy with rain in the evening and overnight. 7th: Dull start with outbreaks of rain spreading in, some heavy and very blustery. Drying up after lunchtime though feeling cold. Cool overnight with frost on cars with a very brief shower on school run. 8th: Bright start though light showers around. Gradually clouding over. Clearer spells overnight and cool. 9th: Bright start though with plenty of cloud around. Showers, some heavy with small hail at 8.30pm. Clear spells overnight. 10th: Bright start after overnight rain. Cloud gradually decreasing to leave it clear at noon. Cloud returned after dusk and thickened up around 9pm. Heavy rain from midnight. 11th: Cloudy, damp and cold start. Some breaks after noon then clear spells overnight and cold. 12th: Sunny, cold start. Clouding over at midday to leave cold-feeling afternoon and overnight – too much wind for a frost. 13th: Bright, cold start but turning mostly cloudy. Rain in the evening and on ride home. 14th: Rainy. cold start, then cloudy with sunny intervals. Cold air digging in from midday. 15th: Sunny all day with just a few cirrus. Took a while for frost to form properly. 16th: Sunny, frosty start with just a few cirrus. Variable cloud and evening in London felt freezing. Some drizzle, this turned heavier and by 4am thick flakes were falling to give a thin covering. Some 1cm at High Beach during a bike ride. 17th: Cloudy start. Thin covering of snow (<1cm) thawed by lunchtime. Cloud built into afternoon to leave chilly evening. 18th: Bright start but sunshine was weak so felt cold. Mostly clear into the evening allowed for an early frost. A classic radiative cooling night until the early hours, assisted by a very gentle low-level flow off the continent where there were some very low dew points. Between 2am and 6am there was some thin, high-level cloud that drifted across, which stopped the radiative cooling. Warmth from the ground then briefly lifted the temperature until, once more the cloud cleared after 6am and allowed the temperature to fall again to its minimum of -5C at 0809z. There was also a little mixing of the layers of air between 2 and 6 which would also have had a cooling effect. Had it not been for the cloud I’d suggest that the low could have fallen to -6.2C, which would have been the coldest since February 2012 when it fell to -9.2C over full snow cover. 19th: Sunny all day with occasional alto-cumulus drifting across. Another cold night, the coldest in 3 years. 20th: Bright start with lots of scattered cumulus. Sunnier early afternoon and less cold. Another frost quickly forming after dark. 21st: Frost lifting quickly then cloudy with limited brightness throughout the day. 22nd: Cloudy start with rain arriving at 9.05am. Bursts through the day until early afternoon. Some brief brightness in the late afternoon. 23rd: Sunny, cool start. Clouding over with rain in the evening. Very mild. 24th: Cloudy start after overnight rain. Mostly cloudy with odd spot of drizzle though bright. 25th: Sunny, clear start though cloud bubbled up at 11am to leave mostly cloudy afternoon. Clear spells overnight and chilly. 26th: Cloudy and increasingly gusty up to midday. Some rain in the evening. 28th: Sunny all day with just a few clouds around noon. 29th: Cloudy and breezy with some drizzle in the wind early afternoon. Report of 101mph gust on Shetland from Storm Gertrude. Wind seemed to strengthen at midnight before rain arrived. 30th: Cloudy and damp start after overnight rain. Sky soon cleared to leave mostly sunny afternoon. 31st: Drizzle in morning as warm front moved in. This year finished as the ninth warmest year on record – some 0.5C cooler than 2014. Every month of 2015, apart from September, November and December, was roughly average – the means being within +/-0.7 every month, bringing the mean temperature to 11.9C, 0.7C above the 1981-2010 average. Rainfall was less remarkable with the year being dryer than average. The total of 553mm puts it as the 162nd wettest since 1797. It was also a very slightly duller than average year with 1,433 hours of sunshine recorded. That’s 97 per cent of average, the 77th dullest since 1881 – the least amount of sunshine for 11 years. For a review of each month, click January, February, March, April, May, June, July, August, September, October, November, December.